Posted December 2nd, 2014 by TheGolfersClub & filed under Debates, Feature Articles, Miscellaneous. Tickets for The 2015 Open Championship at St Andrews have now gone on sale but once again the issue of ticket prices has reared its head. Early tickets can be purchased for £70 – a £5 increase from last year or from May 31 tickets will be £80. The £70 is a £10 increase on the ticket price from the event at St Andrews in 2010. Are the prices too high? 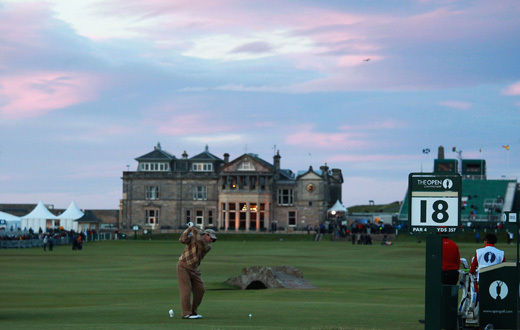 Or is it good value for money for a day out at the biggest event in the golfing calendar? James Savage and Karl Hansell from National Club Golfer debate the issue. JS – I don’t think a £10 price increase over four years is excessive. I regularly pay £70 for England Test match tickets when there are about 10 every summer I could go to. The Open is a one-off. And an Open at St Andrews is even more special. A day at The Open is a full day of sport and a rare opportunity to stand within touching distance of the world’s best golfers competing for the biggest prize in the game. History will be made and you can be part of that history. A day at The Open will live long in the memory. Surely that is worth £70? KH – I don’t know, it’s going to have to be an awful lot of history, and a £70 ticket doesn’t exactly guarantee I’ll even get to see it. Don’t forget £70 is the discounted rate if you order before June 1 – it’s £80 after. So a day ticket costs about the same as a family’s weekly shop. And you can say it’s a whole day’s entertainment, but add in a family who want feeding and souvenirs, and suddenly things are adding up to a heck of a lot more than £80. JS – Well, under 16s get in for free and there’s nothing to stop you taking your own food. But I completely agree that refreshment prices are far too high once you get in. You’re looking at about £10 for a burger and a pint which is scandalous. But you don’t go to The Open for the food. You go for the atmosphere, the golf and the prestige of the event. KH – But when you get there, there’s no guarantee you’ll see anything. Unless you’re willing to camp out in a greenside grandstand all day, you’re likely to be wandering around the course hoping for a touch of prescience or sheer luck that means Rory’s wayward drive will land at your feet. Otherwise, from four rows back, halfway down a fairway, you may not catch much action. JS – My advice is find a decent vantage point early on – green or tee grandstands are great – then wait for all the top players to pass through. Then spend the rest of the day getting around the course, accepting that you may not get the best view. It takes a bit of planning and commitment but is well worth it. Everyone I spoke to who went to Hoylake in the summer thought it was fantastic. KH – In 2013 ticket prices were cited as a reason for poor attendance at Muirfield, and that’s why the prices were frozen this year. But that didn’t help and less people saw Rory’s Hoylake triumph than watched at the same venue in 2006 when Tiger won the Claret Jug. Why do the R&A think things will be any different next year? JS – The fantastic weather in 2006 was a massive factor behind the attendances and there was the chance to see Tiger Woods in his pomp. Why will things be different this year? Rory defending the Claret Jug at the Home of Golf and Tom Watson’s farewell Open appearance (I’m welling up just thinking about it). Theres’s two reasons why fans will come flocking.